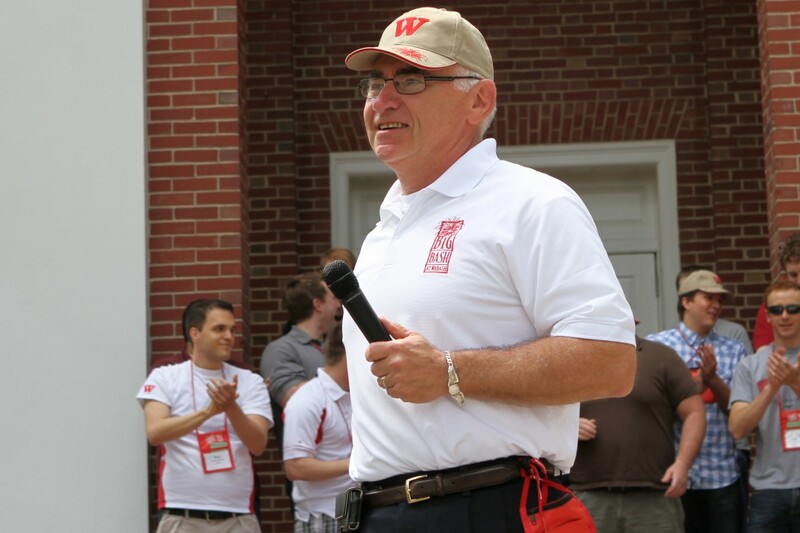 Today marks Tom Runge’s last day as Director of Alumni and Parent Programs at Wabash and the beginning of a deeply-deserved retirement and third career into what will likely be an even fuller life with his wife, Carol, his children, and grandchildren. In one he’s standing and talking in front of the Chapel with a microphone in his hand. In the other he’s sitting in the home of an alumnus saying hardly anything at all. In the first we’re at the inaugural Big Bash, Tom’s reimagining of reunion weekend. (He’ll insist it was the idea of others and his team’s work—I’ll push back and say it doesn’t happen without him.) The registration numbers had been discouraging early on. Tom says it’s going to be more like “Micro-Bash.” But this being Wabash, a lot more people show up than RSVP. This idea just might be a good thing after all. But there’s a bit of energy still lacking. Uncertainty. We’re about to try the first Alumni Chapel Sing. The returning alumni may know the song, but they don’t know this drill. Enter The Grunge. Tom as wise-cracking, light-hearted, ebullient MC. Directing the action, teasing those who don’t know the second verse, smiling through it all like he was born to the role. He’s been a Commander in the U.S. Air Force, but I’ve never seen him take command quite like this. Maybe to a guy who once flew the F-111 swing-wing fighter and taught others to do the same, this just doesn’t seem that hard. And that energy and over-the-top enthusiasm creates the festival atmosphere and “wow” moment our first Big Bashes needed to become the success the event is today. Getting together is worth celebrating, and we needed someone to step up and say it out loud. Even if that guy didn’t particularly want to be in the spotlight. I’ve watched Tom put personal preference and ego aside again and again over the years to become whatever this good place of his needed. I’ve wondered at his willingness to take on whatever interim job they came up with. I’ve been amazed at the previously unrevealed skill set he’d draw on to show up and serve. And more than once at the end of Big Bash Saturday I’ve dropped in on him in his office in Hays as he’s counted the guys who signed the register. As the classes get together for their reunion dinners, he eats his alone. He savors the number of guys who have returned and embraced their classmates and the College. And he relishes the calm and the solitude at the end of that day. The “Grunge At the Mic” role took a lot more emotional work than many may have realized. In the second image we’re on the road together in Florida after he’s convinced me to interview General Earl “Punk” Johnson, U.S. Air Force (Retired). Tom has promised stories like I can hardly imagine. The General has flown planes almost as long as there have been planes—from biplane trainers to B-29s in World War II to B-52s in Vietnam. Trained the crew of the Enola Gay. Spent a Christmas showing Charles Lindbergh around a South Sea island. Counts presidents and prime ministers among his friends. 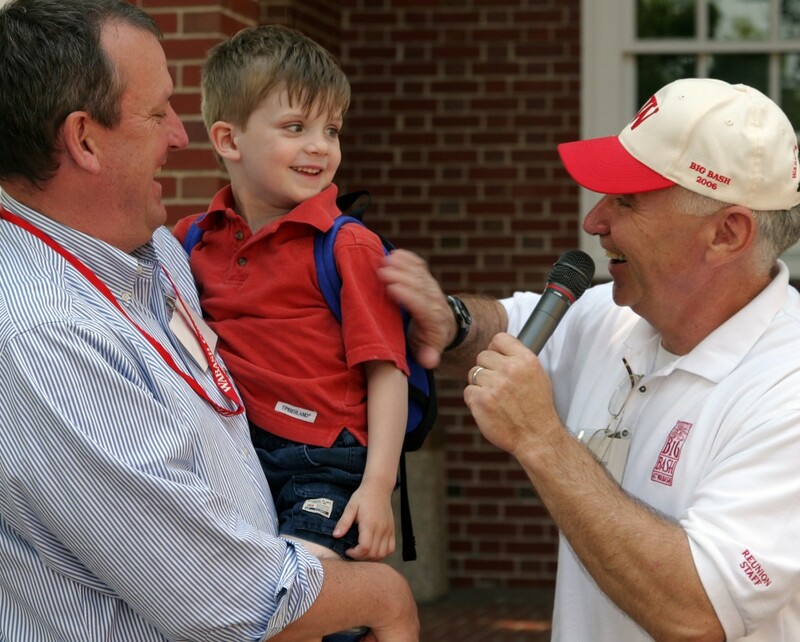 When we arrive at the General’s home, it’s Tom’s obvious and deep respect for the man I’m most moved by. But soon it’s the General himself—his generosity, his stories, his place in history—that practically overwhelms. I ask most of the questions; Tom sits off a ways and mostly listens. It’s a role he’ll play over and over as we work together and he finds for the magazine some of the best stories or just the right person to write a remembrance. This is Tom in what I think may be his favorite “job” here. He’s gotten together two people who need to meet or re-connect. He’s sitting in the chair smiling, listening. He can create those moments (and photograph them beautifully, as well) because his own experience of returning to Wabash has been so genuine and central to his transition from the Air Force to civilian life. He came back a bit wary, not sure how he might fit in. He leaves having redefined the job. That’s because as good as Tom is at taking on whatever role necessary to serve, he can’t fake faith. He lives it. 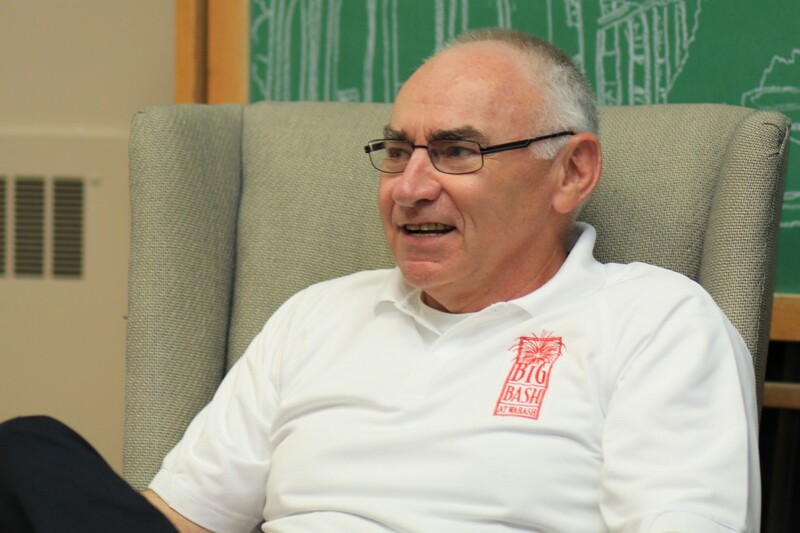 Be it the religious faith at the core of his life, his love for his wife, Carol, and his family, or his belief that Wabash is a good place, warts and all. Being a part of this place has been good for him, and he believes it will be good for alumni. He believes alumni can be equally good for the place. He believes this because it’s been true in and of his life. That integrity walks in every time Tom Runge enters a room. Wabash has been blessed to have him here. A third image comes to mind. The open door of Tom’s office. Students here speak of the importance of our professors’ open doors, their willingness to answer questions and to put other work aside to be there for them when they need them. Tom has been that person for many here, including me. A supporter of my work when I was uncertain, a place of refuge when there was no place else on campus to go. I will miss that open door. I’ll keep mine open, in case, from time to time, he wants to drop by this “good place” that good man has made better.